Initially turn on the engine and switch on your heater to hot, this will circulate around the car and start to defrost the windows. Stating the obvious, do not ever leave your car unattended! If you leave your vehicle running unattended on a public highway you may face a fine and in the drive way a potential rejection of an insurance claim if the car is stolen. You wouldn’t leave your front door open at home whilst you went out would you? Now that you have your car running get your ice scraper or deicer out and work your way around the car ensuring that you scrape all of your windows completely. 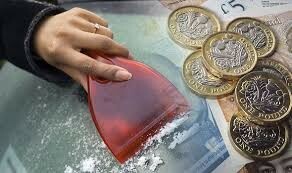 Never ever use boiling water as a means of deicing, you run the risk of cracking your windscreen, a costly and avoidable bill! Gently lift your wiper blades away from the windscreen before attempting to use them to ensure that they are not frozen to the windscreen. If there has been snow fall ensure that you remove all of the snow from your car including the roof. It can be incredibly dangerous for other road users behind you if you have piles of snow on your car, when it comes away from your car it will likely land on those behind you. Never attempt to remove the snow from your windscreen using your wipers, you could burn out the motor because of the weight of the snow. Follow these basic steps and you'll not go wrong!